The death toll from record floods in the US state of South Carolina jumped to nine Monday, as tens of thousands of people lost power and had no drinking water. Shaken residents sought refuge in shelters, while authorities carried out evacuations by air since hundreds of roads and bridges were closed to traffic. Some 26,000 South Carolinians did not have electricity and 40,000 had no drinking water, Governor Nikki Haley told reporters on the outskirts of the capital Columbia, which has been especially hard hit. Haley, who confirmed the latest toll, has called the extreme floods a once-in-a-thousand-year event. At least nine dams have failed, according to Columbia Mayor Steve Benjamin. President Barack Obama signed a disaster declaration, which makes federal aid available. Covering the counties of Charleston, Dorchester, Georgetown, Horry, Lexington, Orangeburg, Richland, and Williamsburg, the assistance can be used for things such as emergency housing. Water distribution points opened in Columbia for 1.5 hours before the curfew, in place for a second night from 7:00 pm to 6:00 am. Other distribution centers were due to be added around the state in the coming days. Local media reported firefighters were pumping fresh water to the water systems of Columbia’s hospitals, which, like the rest of the city, had been advised to boil water before using it. Schools were still closed in Columbia, along with most government offices and shops. 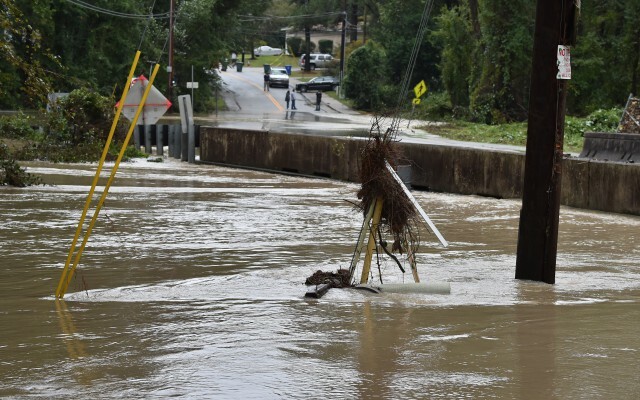 The tropical air mass that has drenched the southeastern state since Thursday dumped 14 inches (36 centimeters) of rain over the weekend, a new record, according to the National Weather Service. That downpour caused sudden and dramatic flooding throughout the state on Sunday, leaving residents scrambling for safety. “Our house, car — we lost everything. Everything is underwater. We didn’t get time to do nothing,” said Patricia Harde, 48, who fled with her two adult daughters and their four small children, including a four-month-old baby, to a school-turned-shelter. “The water was coming up to my waist when we left,” she added. Firefighters came to rescue them. But while some rode in a boat, others had to walk through the rapidly rising, dirty water. The water was still rising when they got to first shelter, so they moved on. “I’d always seen this on TV, but I never thought it would happen to us,” said Harde, whose birthday was Monday. The Red Cross has opened some 30 shelters across South Carolina. Even residents who were able to remain home were rattled. “It was traumatic, I’ve never seen anything like this,” said Phyllis Jones, a 50-year resident of Columbia, the state capital. Jones lives in an upstairs apartment at a complex called Willow Creek, whose namesake waterway completely inundated the ground-floor units Sunday with flash floods. “It’s the first time I’ve ever seen this,” said Ken Hart, 49, as he sat on a cot at a Red Cross shelter at St Andrews Middle School in Columbia. Several people slept, their faces buried under sheets bearing the humanitarian group’s emblematic red cross, while children played on a stage in the school theater. Several dozen people were still sheltering and eating here, helped by volunteers. The night before, there were twice more — about 150 — according to the Red Cross. Rescue and repair workers were hard at work, Haley said, adding that 25 helicopter evacuations had already been conducted. Across the state, some 550 roads and bridges — some of which were completely washed out by flash floods — were closed to traffic. In the historic coastal city of Charleston, population 130,000, more than 900 people were being housed in 25 emergency centers Monday. Eva Gadsen, 72, heard someone at her door Sunday morning saying she needed to get out. “When I opened the door, the water was at my waist,” she said, and when she opened it, the water rushed in. “When we got around the corner, I saw the fridge coming out of my apartment, going across the water,” she said. “Thank God I am still alive and I have a place to stay. People who went back to the building say everything is lost.